Description of "A Marriageable Age"
The day her daughter turned 21, Mrs. Devaki Nair began petitioning the universe for a suitable son-in-law. But, three years later, even as her sister’s daughter is packed off to Dubai in the company of an ‘arranged husband’, her daughter’s status is still to move from ‘Miss to Missus’. The petitions now gather momentum, as uncles, aunts, marriage-brokers, astrologers, planets and gods are pressed into the groom-hunt. Just when it seems that the universe is about to grant her petition, events march off in a direction that leads away from the marriage hall, leaving the never-say-die Devaki to make sense of a baffling new world, where daughters, prospective grooms, and husbands are junking time-tested Standard Operating Procedures, and striking out into uncharted territory. Can Devaki come to terms with a world that seems intent on ripping off every self-evident truth and every ‘alternative fact’ she has ever used to script the story of her life? She made her living from journalism, publishing and eLearning. Then one day, Renuka Radhakrishnan decided she had enough dope on life to shape bits of it into works of fiction. This Bangalore-based writer is a 'would-be-if-could-be sit-down comic', for dammit, stand-up is harsh on 54-year-old knees. 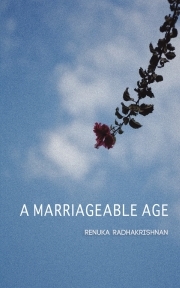 Reviews of "A Marriageable Age"